1894 The Monarch Bicycle Company of Chicago, Ill. understood what sold bicycles. The company used this subtle approach as the cover of its catalog. Use the links to view the complete catalog. A standard safety bicycle, the Model No. 10 weighed 22 pounds and sold for $100. The 18-pound racing Model 12 sold for $125 and featured metal toe clips for bicycle shoes. Monarchs were sold in Portland by the Webb Safe and Lock Co.
July 4, 1895 "Portlanders always enjoyed a big celebration on the fourth of July. That of the year 1895 was most magnificent and lasted for days. On July third there were boat races and at night there was a great illuminated parade in which 1,200 cyclists participated, with prizes for the first and second best decorated wheels. The parade was so long that it took an hour to pass any given point. On the fifth there were bicycle races." Bicycle sales increased as the city's population grew and prices fell. Some 2,000 bicycles were sold in 1897, about 2,500 in 1899 and more than 5,000 in 1900. An 1899 Hartford model from the Pope Manufacturing Company (Columbia) store at 132 Fifth Street sold for just $35. Mitchell, Lewis & Staver Co., at 1st and Taylor, sold Phoenix models for $30 and $40. Photographer unknown, Hazel E. Johnson Collection. 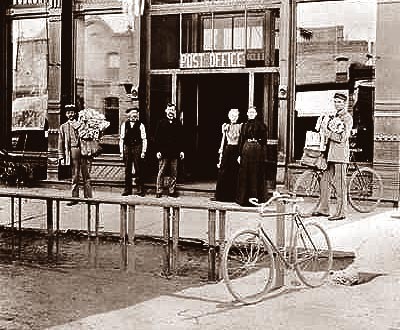 1895 The old hitching rail in front of the Greely, Colo. post office was modified to do double duty and keep up with the times on an unpaved street. Americans might have been shocked by the thought of a woman wearing pantaloons or bloomers pedaling a bicycle, but the French knew what sold in 1895. 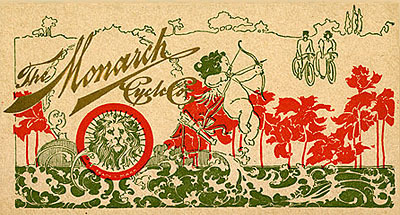 This lithograph by G. Massias in Paris advertised a popular brand of the day. 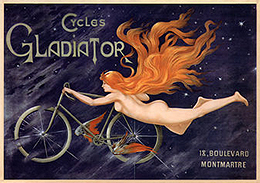 Pedaling History presents a collection of antique bicycle posters. Taiwan's Bik Museum also displays an extensive collection of posters and turn-of-the-century bicycle components. 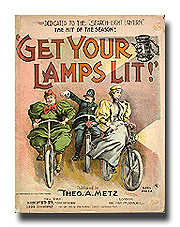 "Get your lamps lit, get your lamps lit, it's a law that you must have a light," begins the chorus of this 1895 ditty that reminded New Yorkers that night riders needed lights. 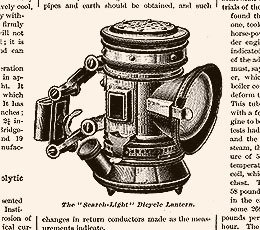 See a modern collection of antique Carbide Bicycle Lamps, or read a contemporary perspective, The Bicycle, The Wheel Of To-Day from the June, 1895 issue of Scribner's magazine by Philip G. Hubert, Jr.